Protests continued to demonstration along the Magnificent Mile through the evening on Black Friday. CHICAGO (WLS) -- Hundreds of protesters marched on Chicago's Magnificent Mile on Black Friday, three days after the release of video showing the 2014 shooting death of Laquan McDonald, 17. The largely peaceful protest shut down traffic on Michigan Avenue for several hours between the Chicago River and the Water Tower shopping mall Friday afternoon. Traffic re-opened at about 4 p.m., but several protesters continued through the evening to block major stores, such as Nike. Some shoppers were blocked by the protesters and some stores locked their doors. The economic disruption was the aim of the protest, organizers said. Three people were arrested during the demonstrations. Two people were charged with traffic-related offenses, and one person was charged with battery - all misdemeanors. 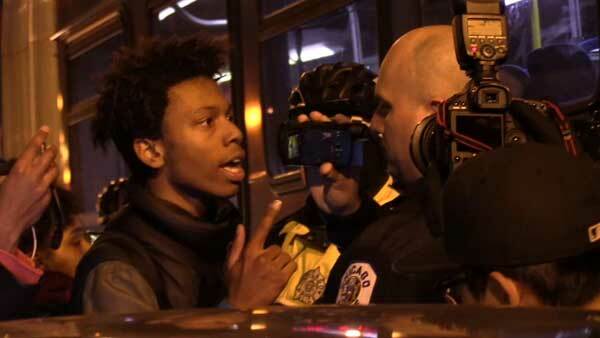 Protesters gather after Laquan McDonald video release. Protesters gathered at Pioneer Court around 11 a.m. Friday and marched on Michigan Avenue north towards one of the city's busiest shopping districts on one of the busiest shopping days of the year. Multiple groups converged near Water Tower Place around noon, forcing police to shut down traffic on Michigan Avenue in both directions for several hours. Chanting "We lose our children, we make you lose money! ", protesters gathered outside Water Tower Place as group leaders called on protestors to stop shoppers from spending money. "The fact that all of us need to be here shutting down commerce in order to maybe get people to think that black lives are important, as everyone else is, is really sick!" said Paige Brown, a teacher. Police blocked demonstrators from entering the shopping center, so they moved on, attempting to keep shoppers from entering individual stores instead. Some were pushed off, while others, like an elderly man and woman trying to enter Neiman Marcus, were gently told the store was closed. They understood why, but didn't appreciate being kept away. "Sixteen shots. I read the paper. I know what it is," said Ivan Stone. "We don't want to shop. On the contrary, I want my money back," said Gala Stone, who was trying to make a return. Shoppers endured shouts, and others who felt trapped inside watched and waited for the crowd to disperse. The group fragmented around 1 p.m. as a smaller faction marched south towards Wacker Drive. By 4 p.m., Michigan Avenue had reopened to traffic. It is likely protesters were at least somewhat successful in hitting the city where it hurts: the pocketbook. Now, activists like Fr. Michael Pfleger want to see action. He is demanding a resignation from Cook County State's Attorney Anita Alvarez and has similar counsel for Mayor Rahm Emanuel and Police Superintendent Garry McCarthy. "If they knew about this for thirteen months, yes," Fr. Pfleger said. The Reverend Marshall Hatch, chairman of the Leaders Network of Chicago, told ABC7 Eyewitness News Friday morning that Laquan McDonald's death affected many people in Chicago's neighborhoods and they want the rest of the city to see how. "This is something that has touched the conscience of our entire city. We need to project just how the pain that we're feeling in neighborhoods now needs to be felt on Michigan Avenue," Hatch said. The Magnificent Mile Association released a statement Thursday that said in part, "We respect the American freedom to assemble and the process in the pursuit of social justice. We hope that any assembly on Friday will continue to be peaceful." Hatch said the people want to see justice for Laquan McDonald and to see change in Chicago. "Without some disruption, there is not going to be any change. I think that people are very much interested in sending the message that now is the time for change in Chicago," Hatch said. The graphic dash-cam video shows Chicago Police Officer Jason Van Dyke shooting McDonald 16 times in 15 seconds. On Tuesday, Van Dyke was charged with first-degree murder in the teen's death. He was ordered held without bail.